This book, a re-issue of the 1999 edition, demonstrates that the way of life we call Christian is lived in relationships to others. Christian faith, understood as practical piety, calls for a life opened to the world at large, concerned for the "stranger" as well as for the neighbor. Sedgwick further emphasizes that the Christian life is grounded in the experience and worship of God. His work thus develops Christian ethics as "sacramental ethics," an ethic that has at its center a deepening encounter with God. Written in a style accessible to non-specialists, this book provides teachers, pastors, counselors, and general readers with an ideal introduction to Christian ethics. It renews the topic of Christian ethics by showing readers that faithful moral living is achieved through the daily practices of grace and godliness. The author first explores the foundations of Christian ethics as seen by both Catholics and Protestants, and then develops a constructive view of morality as a way of life. 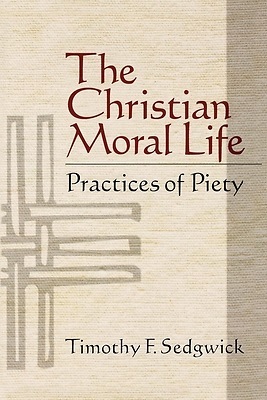 Taking into account the central themes of Christian ethics, he shows that effective piety is built on spiritual disciplines that deepen our experience of God: prayer, worship, self examination, simplicity, and acts of hospitality.